This is what I have so far and the #2's seem to be working out just fine thankfully, I didn't want to have to start again! Update as of 4/27: I redid all but one of the videos. I worked a bit on the socks before showing how to work the different stitches and I feel it's much clearer to see than working from the cast on. In the last post we got as far as to cast on, join and work one K round then stop. The reason to stop there is because for the Estonian Cast On traditionally you work a K round then a P round before starting whatever kind of cuff treatment you want. I didn't want to overload you with information so I didn't explain how to work a purl round. I wanted to wait until I could make a video. So here now are the videos in all their rough edge glory! This first one shows transferring stitches "A, B, A, B" in case there was any confusion. Video #2 shows how to join in both Continental & English. In these videos the English way comes in usually @ the 1 minute mark. Video #3 shows how to work the Knit stitch in both Continental & English. Video #4 shows how to work the Purl stitch in both Continental & English. Video #5 shows how to work 1x1 rib in Continental & English. If you've cast on using the Estonian Cast On and K 1 round, now you can P 1 round. For me after the P round I kept on knitting and will keep on knitting until I'm ready to turn the heel. 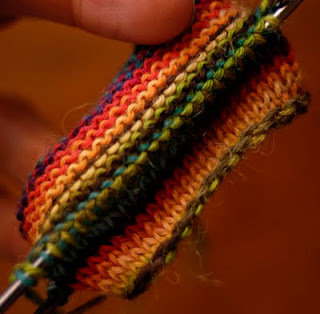 So your next step would be to work the cuff ribbed or not and keep working until you are ready to turn your heel. Get in the habit of checking in with what you've knit after each round. The yarn I'm using has a bit of a tooth to it so it grabs. I like to pull them apart as I go to see if I've made any mistakes. 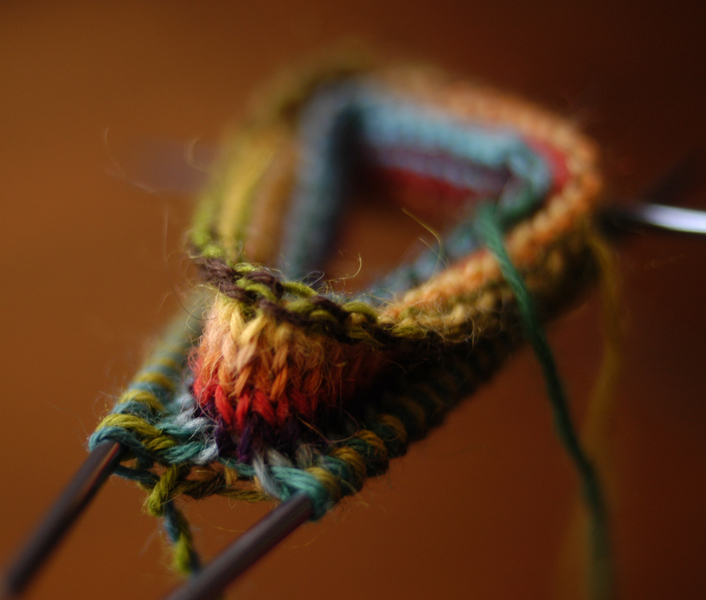 It will be obvious if you've crossed the yarn and connected your socks. 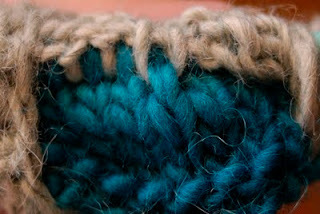 As you can see in this photo the gray yarn got caught behind the blue connecting the socks. Checking in regularly though will help you catch any mistake that is easy to fix when first caught, but is such a pain if not... I'll talk more about that later. I hope these are helpful and that you're still with me. Please comment if you have any questions regarding where we are so far.